Where Empires Collide . . . The Solomani Rim stands at the center of Human and Imperial history. It is home to the Solomani Confederation, an aggressive empire of Human supremacists eager to back their beliefs with force. Adventurers entering the Solomani Rim will discover some of the Imperium's oldest and most developed worlds – and some of its greatest dangers. The Solomani Confederation, and the iron-fisted SolSec that keeps the populace in line. 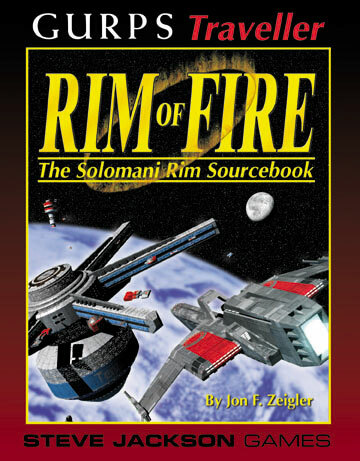 Rules for Solomani characters and sample Solomani Confederation starships. The great clashes between the First Imperium and the Earth-bred founders of the Second, as well as between the Third Imperium and the Solomani descendants of the Second. Life on Terra, birthplace of all Humaniti . . . a shrine to the Solomani, now held by the Imperium. The Vegans and the Vegan Polity, an economic powerhouse that plays an important role in past and present Solomani Rim politics. The Solomani Rim contains more history, honor, and horrors than any other part of Charted Space. Explore it today! GURPS Space – The ultimate toolkit for any campaign between the stars. GURPS Traveller: Behind the Claw – Over four hundred star systems are described in detail, along with essays on the Imperial Nobility and system of government, a detailed history of the region, referee's information, current events and a wealth of adventure material. GURPS Traveller: Sword Worlds – The Sword Worlds stand at the border of the Third Imperium, a small but proud civilization descended from ancient Terran migrants. Their inhabitants have spent centuries fighting for independence – from the Imperium, from the other great empires, even from each other. The complete list of GURPS Traveller books. Warehouse 23 offers scenarios, background information, deck plans, and zines, in digital form, for GURPS Traveller – as well as many of our other game lines. Read the Designer's Notes for free on Pyramid!